Advice for how to share the Webroot WiFi Security app with friends and family. You can share your WiFi Security account with friends and family by installing the app on their device and signing into the app for them. This will give you a chance to set the app up to run as you want. Since you are the account owner, you have the ability to change the password should you want to block others from using your account at any time. Changing the password will logout all other users after approximately one hour. The app can be installed on any number of devices, but the number of simultaneous connections is controlled by the subscription you purchased – 3 or 5 simultaneous connections are available. 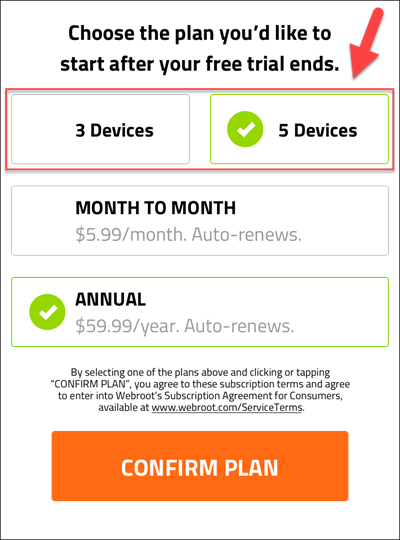 The screenshot below shows the plans offered – 3 or 5 devices billed either annually or monthly. If you exceed the number of simultaneous device connections, you will receive this notification saying there are too many open sessions. 1. Log out of one of your other devices. 2. Change your password (this will log out all other users after approximately one hour). If you are still unable to log in, please contact Support. Click here for support contact information, including ticket submission options and regional support phone numbers.